Cinnober, a worldwide provider of exchange as well as clearing technology to traditional stock exchanges and commodities markets, is now developing a new matching engine for Bitstamp. The new matching engine, called TRADExpress Trading System, will replace the cryptocurrency exchange’s current in-house matching engine. According to the announcement made by the two companies, this new matching engine will dramatically increase Bitstamp’s capacity to match orders. This is especially important since the end of the year usually is a period of massive market activity, like the December 2017 rally. Switzerland’s Financial Market Supervisory Authority (FINMA) has recommended to banks as well as financial institutions that they should estimate coverage of risk for cryptos at 800% of their present market value. The local news portal Swissinfo claimed to have seen a confidential letter from the FINMA to the EXPERTsuisse (Swiss Association for Audit, Tax and Fiduciary) in which the watchdog explains its stance on buffers for cryptocurrencies. In that letter, the agency explains that financial institutions should simple allocate a risk weight of 800% in order to cover credit as well as market risks, whether or not that asset’s position is being held in trading or banking books. Hilda Heine, the President of the Republic of the Marshall Islands, is facing a vote of no confidence because of her plans to introduce a national cryptocurrency. The creation of the national digital currency, called the Sovereign (SOV), had initially been endorsed by the Marshallese Parliament in February. The plan was to release the new national cryptocurrency before the end of this year. The SOV would be used in conjunction with the US Dollar, which is the island nation’s official currency. According to President Heine, the launch of the new cryptocurrency would be another step advancing their country’s national liberty. However, on Monday, a cabal of 8 senators put forward a vote of no confidence against Heine’s administration. 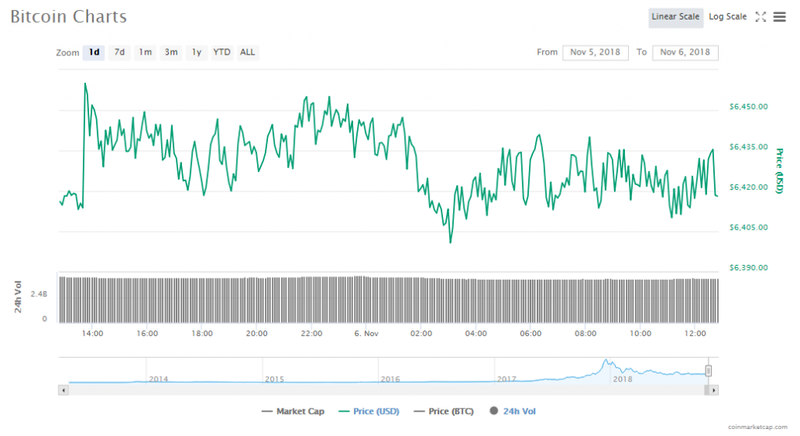 The cryptocurrency market’s capitalization has gone up by $1.58 billion to $213.48 billion, but its trading volumes have slipped by $1.29 billion to $13.27 billion. The price of Bitcoin is currently at $6417.40 per token, which is a 0.26% drop since yesterday. The digital token’s market capitalization is currently $111.41 billion and its trading volume is at $4.24 billion. Ethereum currently has a token price of $208.55, which is a 0.10% increase since yesterday’s price. 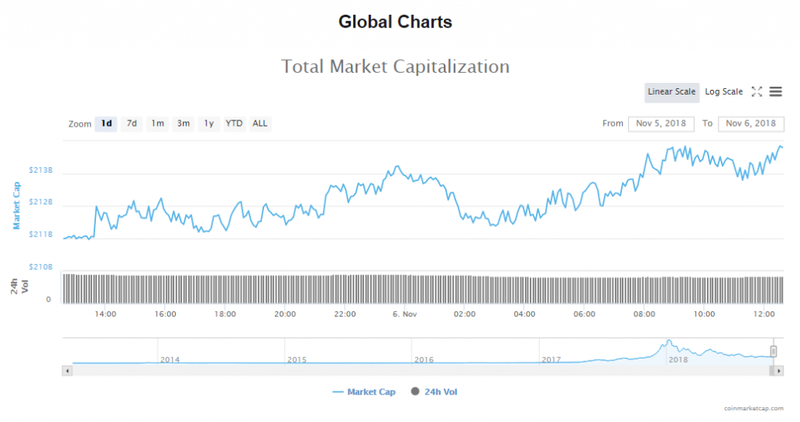 The crypto’s capitalization is now $21.48 billion and its volume of trade is $1.66 billion. The top ten cryptocurrencies in the market are currently showing a mixed bag of results. BTC, ETH, EOS and USTD have lost traction since yesterday’s positive moves, however, the drops these digital assets are currently experiencing are marginal. 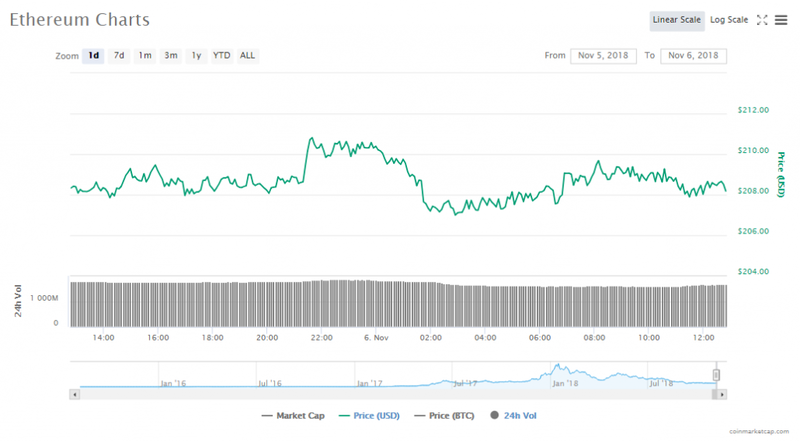 The biggest gains in the trading so far today has been seen by XRP, which is up 9.79% since yesterday, followed by XLM, which has gained 3.16% in trading today. Bitcoin is currently $6417.40, slipping 0.26%. The worth of the crypto is now $112.07 billion. Ethereum is currently $208.55, slipping 0.04%. The crypto’s worth is $21.48 billion. Ripple is currently $0.507961, increasing 9.79%. The crypto’s worth is $20.42 billion. Bitcoin Cash is currently $559.19, increasing 2.87%. The crypto’s worth is $9.75 billion. EOS is currently $5.47, slipping 0.07%. The crypto’s worth is $4.95 billion. Stellar is currently $0.250122, increasing 3.16%. The crypto’s worth is $4.73 billion. Litecoin is currently $53.82, increasing 0.64%. The crypto’s worth is $3.17 billion. Cardano is currently $0.077196, increasing 2.88%. The crypto’s worth is $2 billion. Monero is currently $113.04, increasing 2.32%. The crypto’s worth is $1.87 billion. Tether is currently $0.993763, slipping 0.07%. The crypto’s worth is $1.76 billion. According to local news reports, 7 major cryptocurrency exchanges in South Korea have passed their government’s security audits. Bithumb, Korbit and Coinone are amongst those that passed. The cryptocurrency markets across the board saw significant price drops on Sunday on the back of the news that the CFTC (Commodities Futures Trading Commission) has launched a probe into 4 major cryptocurrency exchanges. All the top cryptocurrencies dropped in price, with Bitcoin falling more than 5% – all in the space of 2 hours. According to local news reports, the financial services firm SBI Holdings and the technology company FPT Corporation have together invested $3 million in Utop, a Viatnames Blockchain startup.